Well, it might seem sort of obvious to cover forward. I mean, that's where you are going and your weapon is sort of naturally pointing that way. But it is not always done effectively, either on the move or while stationary. The area in front of the team is always a threat area. It is the area that has not yet been cleared by the team and therefore can be assumed to contain suspects. It is also the area where the team can encounter hostages, unexpected civilians etc. The team must always be on guard toward the front. As I'm sure many of you have experienced, suspects will often appear as if from nowhere and decimate an unprepared team. When moving forward, you should keep your weapon ready and move at a pace that will allow you to engage any targets that should appear. You should be aware that the rest of the element may be following you and will count on you to alert them to any changes and to eliminate immediate threats. One area that is often overlooked when covering forward is the exposure of the team when stopped at a door. 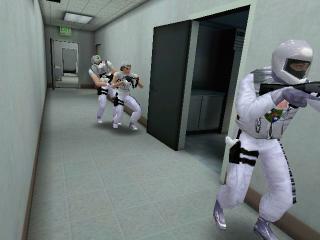 On the left, you see the team stopped at an open door, attempting to mirror. In a "serious game," this would be the view that either Blue 1 or the EL would have of the Red Team, here played by [icarus_uk] and [naiboo]. In such a serious game, it is the job of Blue 1 to cover Red Team. As Red Team is in front of Blue 1, he/she has a great view of their backs, but is not really covering them. 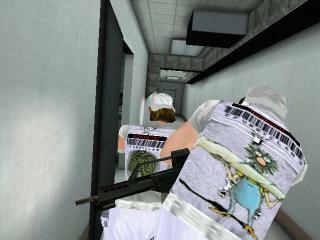 If a threat were to suddenly appear from the end of the hallway, as they often do in this level (Carlyle), then the Red Team would be dead before Blue 1 could do anything about it. If Blue 1 were to move farther to the right (as I know some of you are thinking), he/she would be exposed to fire from inside the open doorway. In either event, as soon as Blue 1 starts firing, you risk a friendly fire incident. When Red Team is getting shot at, they may inadvertently move into Blue 1's line of fire. Just the fact that they are in front of him/her is limiting the available field of fire for Blue 1 and exposing the team to threat. A better alternative to covering forward is to position Blue 1 ahead of the Red Team as a "rolling point" man. He will continue to cover ahead of the team no matter what they are doing. An example is below. In the screenshot on the right, you can see [DoubleTap] playing in the alternative Blue 1 position. As the team advanced down the hallway, he moved past the door and continued to cover toward the end of the hallway. That is the threat area, as it has not yet been cleared by the element. In order to minimise his exposure in the fatal funnel, he could move slightly farther down the hall, away from the open door. As the Red Team, here played by [icarus_uk] and [naiboo], mirror and gas the entry into the kitchen, they are well covered to the front by [DoubleTap]. Any threats that come down the hall from the unsecured areas will be easily dealt with and there is no threat of friendly fire. It is important to note that if this door had been open prior to the team reaching it, then it would have been fairly dangerous for [DoubleTap] to move past it. In such a case you have basically two options. First, you can stay back and not cross the open door. This is probably preferred by many and is the most common tactic. Even in the real world, this would probably be preferred. Your second option is to quickly cross the doorway. By moving very fast (in dynamic mode, you move faster) you will minimise the amount of time spent in the fatal funnel and thus reduce your chances of being injured. There are a couple of things that may work in your favour in the game when using this tactic. First is the responsiveness of the suspect AI. They need a second or so to "wake up" and start to come for you. If you are fast, you may get through unscathed, especially if you first throw a flashbang to cover your passage. The second is that in general, suspects don't shoot through the walls at you. You may sometimes get hit if you are close to a doorway, but if they can't see you, they don't shoot. You should move far enough past the doorway to avoid getting hit.